Etihad Airways is changing the number of Guest miles awards require effective June 30, 2018. The base mileage will stay as of now but the airline will introduce greater variability based on “when you book and fly” (whatever this might mean). The award surcharges are not changing and this change only affects, per the email, economy and business class awards. You can access Etihad’s page for the changes here. The number of Etihad Guest miles required for Etihad’s own awards is already non-competitive and this makes it even more lopsided. Etihad is “enhancing” away whatever worthwhile is left on its program. The changes will come into effect on 30 June 2018. Will this change impact my booking? The change will impact bookings made on or after 30 June 2018. Will this change affect GuestSeats, OpenSeats and Upgrades? This change impacts GuestSeat bookings only. OpenSeats and Upgrades are not affected. Do any of these changes impact new or existing bookings made with partner airlines Air Serbia & Air Seychelles? No, Changes to Etihad GuestSeat booking only impact Etihad Airways’ marketed and operated flights. Will these changes affect my booking with Etihad Guest Airline Partners? No, Changes to Etihad GuestSeat bookings only impact Etihad Airway’s marketed and operated flights. How do I check how many miles will be required for a GuestSeat once the changes have been implemented? Mileage Calculator will reflect the minimum value for a given route. You can also input your desired destination and flight date into the booking engine to confirm the price. Will there be a change in the taxes for GuestSeat bookings? No, the taxes will remain the same. 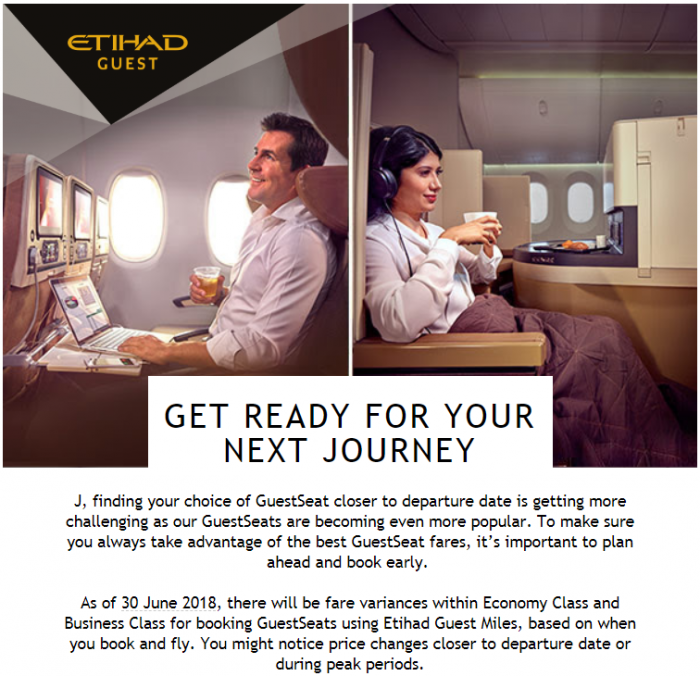 What happens if I have issued my GuestSeat ticket on Etihad Airways before 30 June 2018? The booking will not be impacted by the change. What would be considered as peak period? Peak period is subject to seasonality and availability of seats. What happens if I have issued my GuestSeat ticket before 30 June 2018 and would like to change my booking after the change has come into effect? For GuestSeats issued prior to 30 June 2018, in the event of a date change (post 30 June 2018) the ticket will be re-issued with a date change fee, in line with the Etihad Guest Terms and Conditions. What happens if my GuestSeat ticket is issued on/after 30 June 2018 and I would like to change my booking? For GuestSeats issued on/after 30 June 2018, in case of a date change the ticket will be re-issued, difference in fare (if applicable) will be collected in the form of miles, along with the date change fee. Etihad Guest Terms and Conditions apply. Can my GuestSeat ticket be refunded? A refund fee of 10% of the miles deducted for the redemption ticket will apply on GuestSeats. In case of no-show GuestSeats are non-refundable. Refunds for a GuestSeat have to be processed through the Etihad Guest Service Centre within the ticket validity, up to 24 hours prior to departure. Who do I contact in case of questions? Please feel free to contact us at guest@etihadguest.com or at any of the Etihad Guest Service Centres.